Rush'n Attack is a side-scrolling action game that was also released as Green Beret for various European home computers. Armed with nothing but your knife your task is to work your way through six stages in order to destroy the enemy's secret weapon. There are various bad guys in the game but most are simple palette swaps. This actually helps to distinguish their individual characteristics as certain ones carry guns while others jump-kick when in range. If you manage to kill the crouching, yellow enemy in each stage he'll drop special weapons you can use. These include a gun, grenades and even a star that gives you temporary invincibility like Mario! The difficulty is high and it's not helped by the fact that you need to press Up to jump which isn't very precise. Unlike the Famicom version there are no continues and you don't respawn if you die. There are some checkpoints but later stages are long and it's a pain having to redo large sections over and over again. There's little variety but it's the sort of game that grows on you as it has that 'one more go' factor. 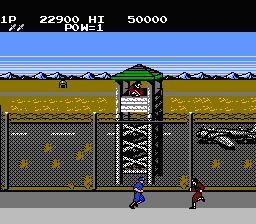 It's basically about memorisation and reflexes and it's similar to Kung Fu (1985, NES) in that regard. The bosses are interesting and easier than the rest of the levels. You'll face things like a pack of rabid dogs and grenade throwing parachutists before reaching the awesome final battle where you have to destroy the secret weapon with your rocket launcher. The music has some dark, adrenaline pumping tracks and they remind me a lot of the original Castlevania (1986, NES). The graphics aren't anything special but the backgrounds are nice with enemy tanks, air fields and snowy mountains. Rush'n Attack is a limited and flawed game but it's also good, dumb fun. It's the sort of title that you'll occasionally boot up for a quick blast but if you actually put the time into it you'll likely start to appreciate its unique arcade style gameplay. Random trivia: The game has been re-released many times throughout the years, including a version for the Xbox Live Arcade (2007) that has enhanced graphics and audio.